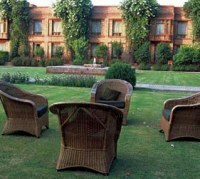 Faisalabad Serena hotel is the best hotel in Faisalabad offerring all amenities of a 5 star hotel. Cancellation Terms and conditions:- Rooms must be canceled atleast 48 hours before the arrival of the guests. Serena Hotel Faisalabad in Faisalabad, offers above rates only to Hunza tours. The online reservation payment must be made to Hunza tours not the hotel. Book your events, Meetings, Conferences Marriage parties at Serena Hotel Faisalabad or any other hotel in Faisalabad please feel free to email us we will offer you the best possible rates and perfect arrangements to suit your events. 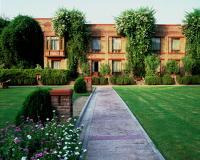 Faisalabad Serena Hotel is Located on 7 acres of beautifully landscaped gardens, Faisalabad Serena Hotel is conveniently located just 2 miles from the teeming bazaars of the city and the famous Clock Tower. The hotel was designed using local cultural traditions for its inspiration, evoking rich Islamic architecture and the exuberant Punjabi colours and decorative arts. The hotel offers guests exceptional standards of accommodations, service, cuisine and amenities. As such it is the natural choice of corporate executives conducting business in Faisalabad or travellers accustomed to luxury and superiour service. The indigenous character of Faisalabad is evident in the decor of the guest rooms that form a wonderful blend of functional comfort and asethetics. All rooms offer exceptional standards of accommodations. The Jhelum Restaurant is open for lunch and dinner and offers continental, Pakistani and typical Punjabi cuisine. 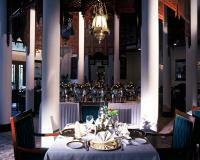 The Xuelian Restaurant, open for lunch and dinner, offers a wide range of Chinese dishes. The Lyallpur Coffee Shop, open from 6 AM to midnight, serves a breakfast buffet in the morning. Local and continental specialities are available throughout the rest of the day. The Pool Deck offers guests light snacks and beverages at the poolside. Whatever your business plans are, from conventions and conferences to meetings and banquets, Faisalabad Serena handles all in a professional manner. On time and well organized, our arrangements ensure that your plans succeed. Providing swift contact through state-of-the-art communication systems, demonstration and projection equipment, Serena promptly facilitates your every need. Other Serena Hotels in Pakistan. Quetta Serena Hotel: Built in traditional Balouch style architecture. Offer very neatly kept rooms and excellent service. Islamabad Serena Hotel: The best hotel of Pakistan.